How the heck do I navigate in 3d? I want to show a certain veiw from a certain room. I can zoom in, and pan, but no way to “walk” to the spot I want to see while zoomed in. Can not figure out how to get to that spot. I’m seconding this. Only “pan” is currently not a pan at all, it’s more like a rotate, with the “center of gravity” always in the center of the screen. 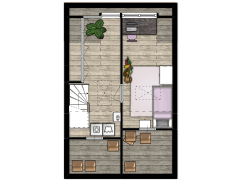 This makes it really hard to get a close up view of small rooms in large floor plans. Perhaps the floorplanner guys could give us a true pan? Maybe while holding down the shift key? Wow 2 years later, and still no pan in 3D. :( I too would really like this to hone in on a room in the corner of the plan. Same here.. and i thought i was doing something wrong.. That would be really useful.. please! Still no way to navigate in 3D view? The absens of this basic feature renders this otherwise very nice application useless. What is the point of planning a corner room if you cant place the camera in that room? Agreeing with everyone else. PAN IS ESSENTIAL!!! !